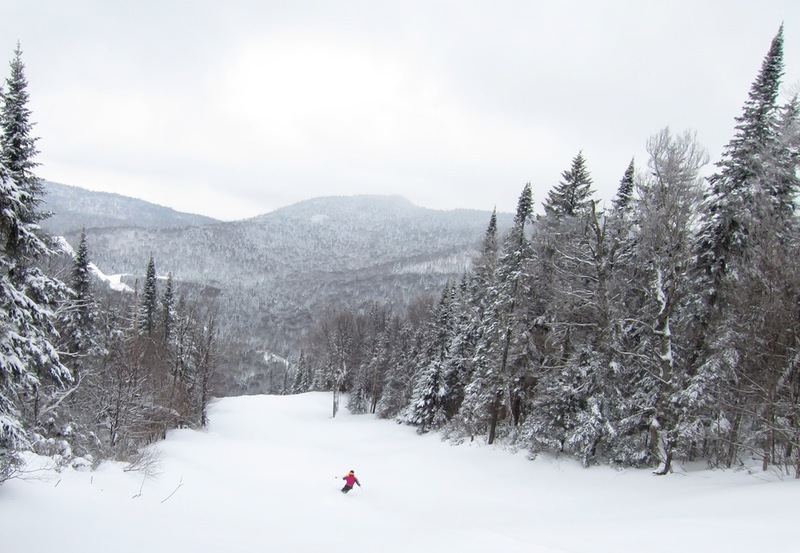 With a weekday free to explore Quebec, I had my heart set on getting to the Whistler of the East with 10″ of fresh. 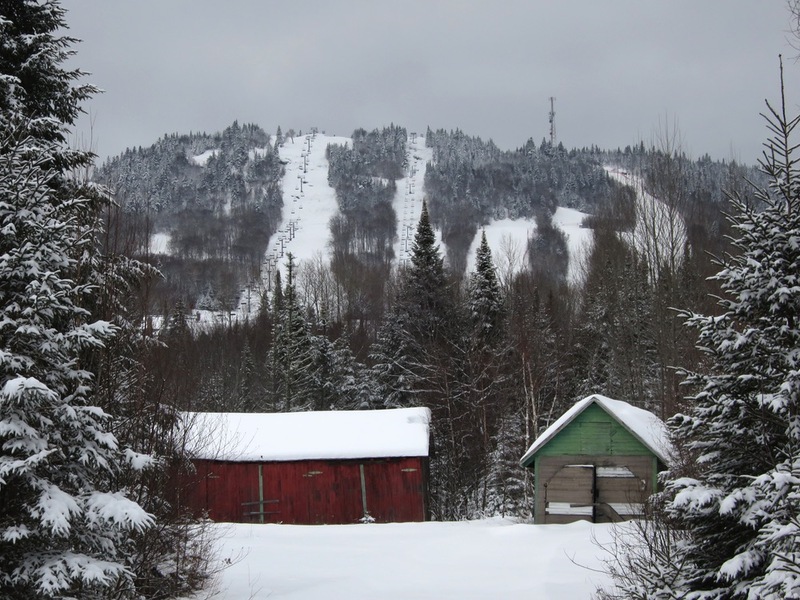 That ski area will remain nameless however, because after many text messages with new friends I was convinced to pilot my car to a much smaller area in The Laurentian mountains: La Réserve. After some technical difficulty on the drive, I arrived. It turns out the A25 bridge is a tolled path. There are no booths, it’s private and I think you need some sort of EZ-Pass. Suffice to say, if you’re heading North to checkout La Reserve, take the 15. Once out of the city, I noticed something else I’ve missed in recent years — big snowbanks. A bit like Neo in The Matrix, the Laurentians are situated far enough North to have dodged rain drops for much of this season. I could have been in the anywhere north of the Artic Circle for all I know, with lots of snow and limited development. The lodge looked very well taken care of, and they were blowing snow at the bottom, always a nice sign… but looking up I wondered about the vert. My friend Colin has described La Reserve as punching above its weight. I imagined La Reserve to be like Manny Pacquio’s little brother stepping into the ring against George Foreman. I can’t recall skiing challenging lines like these at mountain twice the size. The midweek ticket prices didn’t hurt, either. Monday to Friday passes are $15 with the exception of Canadian Spring Break and they give out loyalty cards with your wicket; the sixth visit is free. 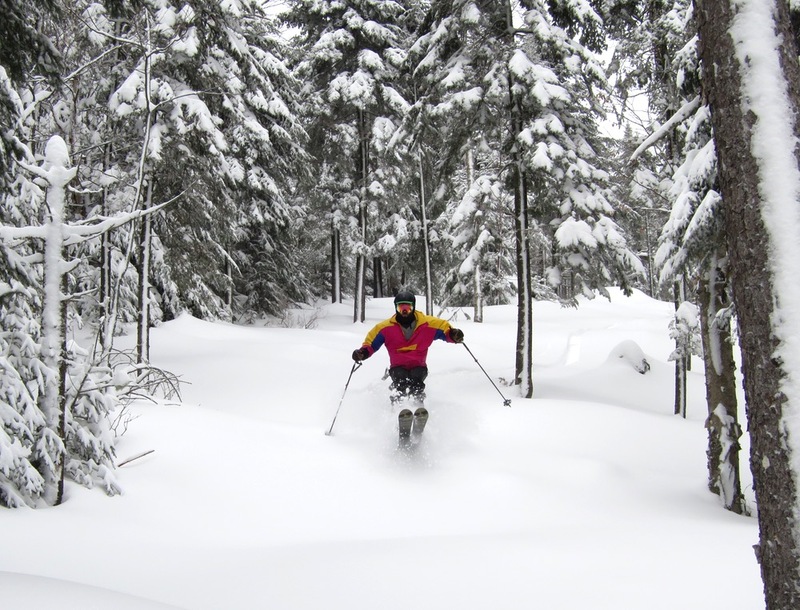 With very little skier traffic, the 6″ from the previous night had settled nicely over a deep base. There were some funky layers mixed in, but they really only showed up on the gnarliest terrain. The rain/melt events that did reach that far north had covered the rocks in an impenetrable glaze, and all systems were go for the first time this year. Lap after lap we threw ourselves off ledges and ripped the woods. After an hour, a patroller asked us if we wanted to get first runs on a Double Diamond they’d been saving. We changed course to leave our mark on Le Vertige. Like all the terrain, it was short and sweet. Steep enough that on the face you have to make fast swooping turns, maintaining enough control to avoid obstacles. 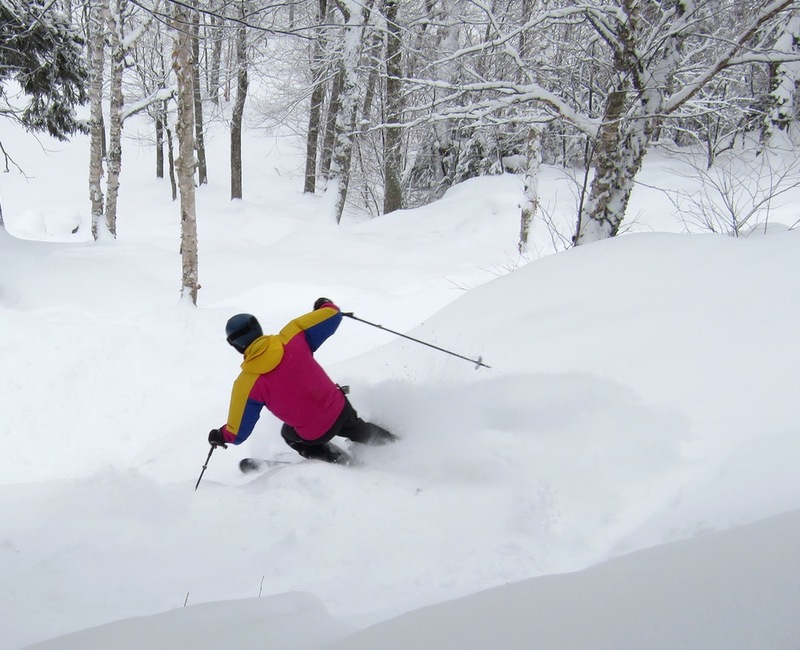 We made our jumps, and skied it out switch to mellower terrain. The rope drop captured the attention of the ten or so other motivated riders, so we moved back to the other areas to find fresh. It was only after this frenzy that I could really see what this mountain offered: nasty steep sections, two terrain parks, even a halfpipe. 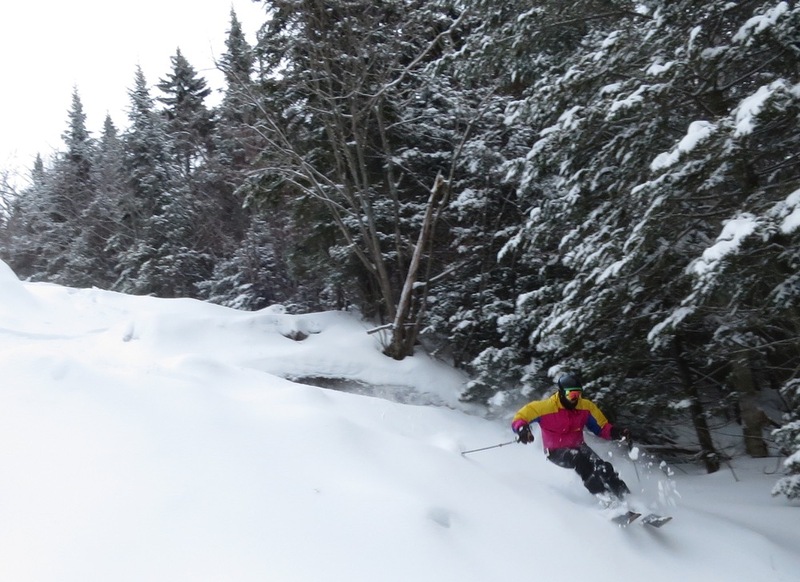 Even the older skiers I saw were greasing zipper lines and flying off of boulders. The magic carpet area was one of the biggest and least intimidating learning areas I’d ever seen. It’s inconspicuous, but still I imagine that toddlers graduate to aerials by the time they’re in grade school. We finished the day with a couple of BC laps to a Cat Access area they run on weekends. This was some of the best steep terrain I can recall in a resort. It was as if La Reserve decided to jump up one more weight class. I can’t wait to step in the ring again. WOW, THAT’S REALLY NICE. THANKS! I was waiting for you to discover this place. It is the Plattekill of the Laurentians. Thank you for the good reportage of our resort Ski la Réserve. Our promotion at $15 is offered every day from Monday to Friday, and then if you are skiing 5 days, the 6th is free. Except for Spring Break from February 29 to March 4, 2016. So invite all your friends to discover our resort! Quebec is the place to be this season – another place that we all need to visit. So much win. Manny Pacquio would be proud. Any word on how far north the NCP reached today? Great to see that you made it to La Reserve. which was one of the stops in my A-15 Magazine article three years ago. I didn’t have time for nearby Mont Garceau, something that should go on your hit list. Shame on you for not stopping at the Saint Donat Bakery for a nun’s fart. Thank you all for the positive comments, it was a great day and I’m happy to have been able to put together a blogpost so well-received. Skimore, on flat ground it was pushing two feet+ before the warmup. On steeps, it was less but i didn’t hit a rock all day. Mogul Junky, you would love it. There are definitely some Hickoryish aspects. Coach, if you can abandon your need for vert, you can certainly still get a lot of miles in with a reasonably fast lift and no wait whatsoever. X, it’s really the Laurentians through Quebec City and the Gaspe that have received average snow but managed to stay under freezing that have snow. It’s pretty sad right now at the naturally dependent areas like Owl’s Head and Sutton. Alas, it’ll happen soon, right?